For the upcoming interior housing trends of 2017, there seem to be a few main ideas that stand out above others. Here are some of the foremost upcoming trends to watch for. There is something to be said about the newer and more “unfinished” look of these. Differing from the past sleekness of the obsidian-like finishes, this look offers a refreshing change from a postmodern touch to something slightly more rustic – but not overly so. Although this offers a more candid approach, it’s not as overt as the rustic trends we saw last year. It might be time to trade out those shabby chic accessories for something a little fresher. Greenery, Navy Blue, and Shadow are this year's colors. 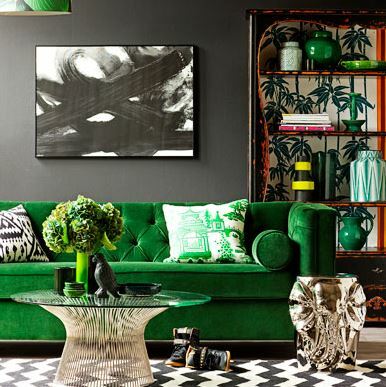 Pantone, one of the leaders in interior design, announced that the bright shade of "Greenery" will color designers’ rooms this year. “Greenery is nature’s neutral. The more submerged people are in modern life, the greater their innate craving to immerse themselves in the physical beauty and inherent unity of the natural world. This shift is reflected by the proliferation of all things expressive of Greenery in daily lives through urban planning, architecture, lifestyle and design choices globally." (https://www.pantone.com/color-of-the-year-2017). Navy blue and shadow offer a different change of pace from last year’s trends, standing out because of its alternate use of a more interesting neutral for paint. However, the green will stand out most in terms of furniture and other backdrops for a more confident look to most homes. Now you don’t have to tell the kids to not touch anything. Accents that will take a front row seat in this year will have to be tactile and interesting to touch. Velvet accessories – even a couch – could do well as a lovely contrast to a shadow colored wall, providing a more modern feel for the house itself. Perhaps a burlap frame for your pictures would do as well. These are simply a few of the trends that are premiering in this month and are to survive for the whole year. Many others were noted with great interest, such as fold up appliances as well as the rise of Detroit, MI, as an artistic hub for those individuals seeking a cheaper haven for their pursuits. Overall, though, it seems that simple yet sophisticated is the key here while balancing whites and greys with jewel tones. Keep this in mind when trying to stage a home keeping these current trends in mind.